An article in the news this week caught our eye and got us thinking about treating burns and scalds correctly. 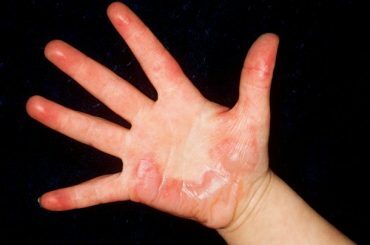 A young child suffered horrific burns following an accident at their nursery. According to the report, a number of alleged safety failings led to this incident. Although First Aid was administered swiftly, flannels were placed on a burn. We shouldn’t place flannels on burns as it could stick to the skin and cause further damage. First we need to identify what type of burn the casualty has sustained. Scalds – steam and hot liquid. Dry burns – friction, flames and hot surfaces. Electrical burns – domestic appliances, lightening and overhead power lines. Be mindful that electricity passing through the body may have caused internal damage. Furthermore, resuscitation might be required if the casualty goes into cardiac arrest following an electric shock. Radiation burns – sunbeds (ultraviolet light), sunburn and X-rays. Chemical burns – domestic chemicals such as bleach and industrial chemicals e.g. gases and acids. Extra care is required when treating chemical burns to avoid dispersing the chemical or getting it on yourself. 1. For a minimum of 10 minutes, cool the burn down under cold running water. With chemical burns, cool the affected area for a minimum of 20 minutes. 2. Remove any watches, rings and jewellery. 3. Use cling film to protect the burnt area from infection. If there isn’t any available, use a sterile non-fluffy dressing. 4. Sustaining a burn can be traumatic so treat your casualty for shock or prevent the onset of it. 5. Call the emergency services especially where chemical and electrical burns are concerned, and when the casualty is a child or infant. Did you find this helpful? Please share with your family, friends and colleagues. For further information or to book one of our First Aid courses and learn more, please contact us or find us on Facebook.